Thanks to Eaglemoss (but probably fluke rather than design) there's a nice little theme running through this month's pair of releases. Both of these ships actually started out as something else. 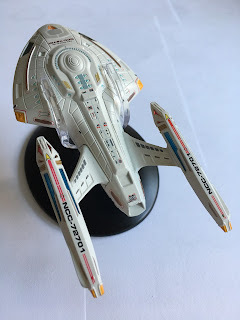 In the case of the Nova Class USS Rhode Island it's an updated version of the USS Equinox while the Assimilated Arctic Transport was actually upgraded and changed during the episode in which it appeared so both of these are in their "final forms" so to speak rather than their original configurations. 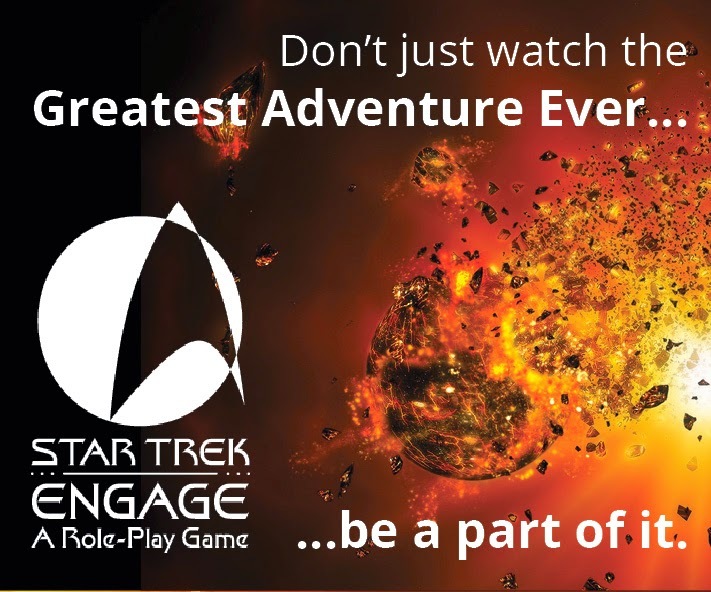 Let us begin therefore with issue 98 and the upgraded Nova Class ship featured in the Voyager finale, Endgame. Now the original version of this ship is one of my all-time favourite craft and with the modifications made for Rhode Island I think it loses a little bit of its endearing character. Not saying that this is a bad model in any sense but smoothing her out and making the mods does make some significant visual differences. Take the nose. 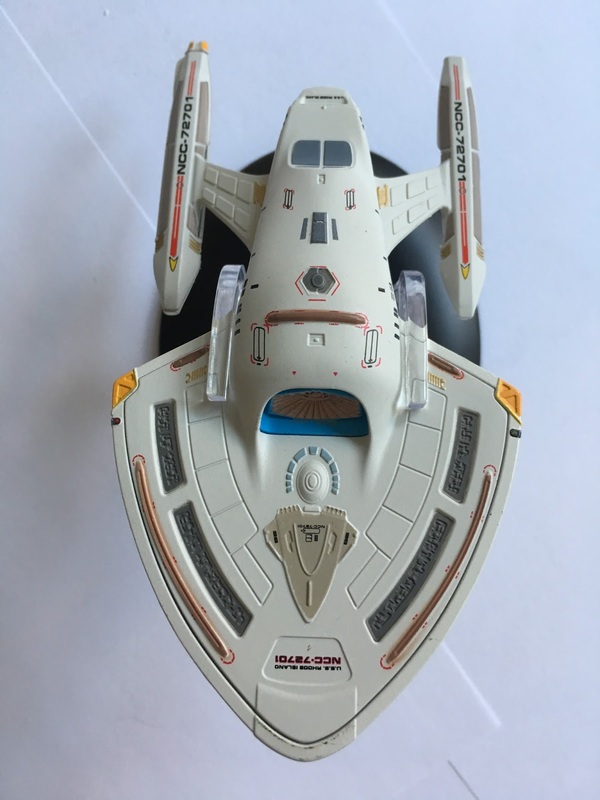 On the original model there was a "cut out" for the secondary deflector at the front of the primary hull while here Rob Bonchune chose to fill in the gap and make that deflector a little smaller. It brings the hull here to a sharp, wedge point and although I niggle it didn't need the change the model does a good job of blending the old with the update. The hull detail is a lot more subtle here than on the Equinox which you will inevitably compare her to and that was a conscious decision during the alterations. There doesn't feel to be as much depth to the panelling here but the surface of the hull still offers up some lesser greebling detail with modified lifeboat hatches and more distinctive phaser strips right across the surface. Indeed with the Equinox there really was no distinct hull detail beyond the panelling but now the updates have made the finish much more striking. The precision on the added paint details is quite wonderful with the Rhode Island especially at the pointy front end with the greys and orange panelling making a real impact visually. It's also in keeping with the paint scheme that adorns the deflector and surroundings on the Equinox but what you do come to realise here is that the overall paint job is a shade or two lighter than its predecessor. Certainly the exposed circuitry detail has been much improved upon and the red decal lines around the nose feel a lot crisper than ever before. Even the registry on the Rhode Island seems a better fit with the red trim as a nice added touch which was sorely missed on the Equinox. Stepping back and another difference is the lack of blackened windows here. 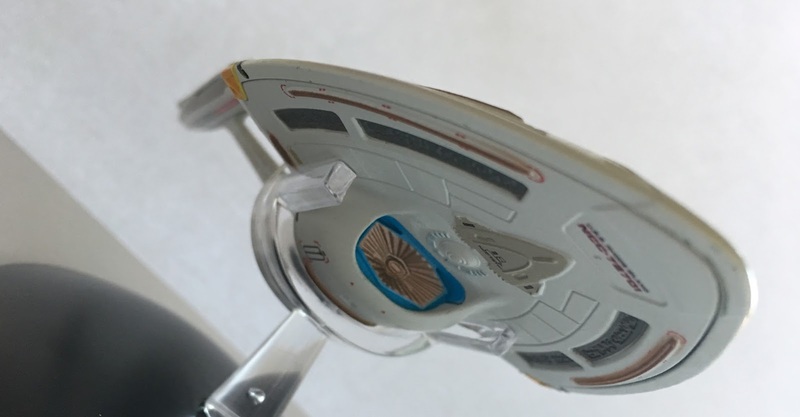 All the square recessed windows most notably are white and it combines well with the lighter paint job on the starship. The trim around the bridge has also been touched up but now the command module sits higher rather than being recessed into the hull. Behind it are some further updated hull markings replacing some more nondescript recesses from before. Looking down to the spine of the Rhode Island and you can spot a big change. The panelling here isn't as prominently marked out and continues the smoother effect right to the rear shuttle bay. The Nova Class vessel is clearly a lot sleeker in every department with Eaglemoss getting a second chance to tweak a collection favourite for the better. While the panelling isn't as darkly marked it has more detail within its confines and this is allowed to shine through with the blacks and greys of various elements contrasting strongly against the light grey of the hull. With the Equinox the darker top coat meant that features were almost drowned by its shades rather than allowed to stand out. The pylons sprouting from the sides of the engineering hull retain their dark markings but the biggest update to the model - and this comes from a manufacturing point of view rather than an "in universe" alteration is the construction of the warp engines. Back on the Equinox the engines clipped together with a seam that ran across the top of the nacelle, slipping the registry marking and leaving a dirty great gap. 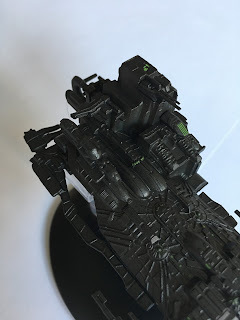 It looked horrible and the bussard collectors were just painted on. It looked a bit ropey to say the least but changes have been made. The nacelles now split along their centre line top/bottom rather than left/right meaning the registry is in tact and it's a much better finish to the eye. 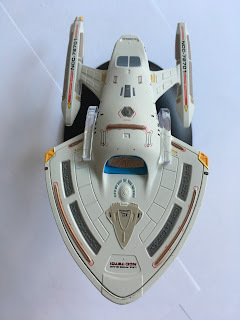 This time the bussard collectors as well as the warp coils are in translucent plastic suggesting a more refined and precise way of creating gaps in the plastic moulds has been found since the holes here appear smaller than the Equinox versions. Note too that the fins have been removed to enhance that sleeker impression. Flip her over and there's some noticeable changes here. 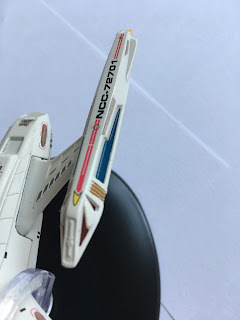 The phaser strip decals are more precisely aligned and some of the grey added detail has gone. The metal upper section now finishes closer to the leading edge than previously and the join is a much better fit. The primary hull details are virtually identical in regards to panelling with a sharper ship registry but the engineering hull itself has been totally smoothed out. In fact two of the recessed panels on Equinox just behind the deflector and two parallel to the pylons have been replaced with decals however the one around the hexagon shaped hatch (warp core ejection point) is just off alignment. 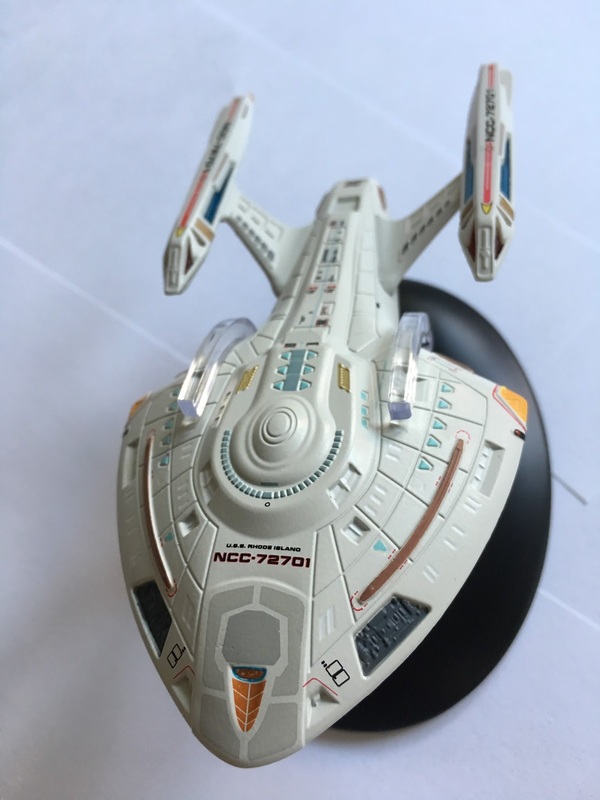 The smoother finish does make the hull a lot less cluttered and I welcome that. It does look a whole lot better. 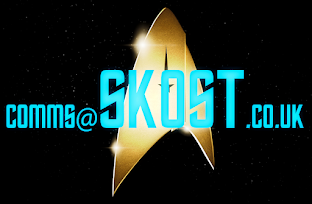 The stand is a re-run of the first, slotting around the edges of the primary hull for a mid-point hold as with many other Starfleet ships. The Rhode Island, while not my favourite version of the class is a whole light year or six ahead of the Equinox when it comes to the presentation of the model. 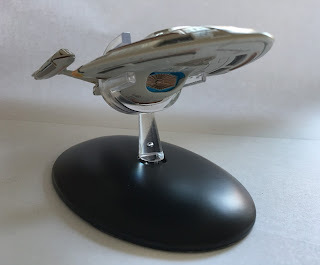 My only niggle is that I had to glue the top of the port nacelle on which had come loose in the box. Minor issue and quickly resolved. I really like the way this model has been developed and honed from the original as well as introducing the updated elements. I and several friends did breathe easier when we saw that the yellow detail on a pre-production model had been removed! 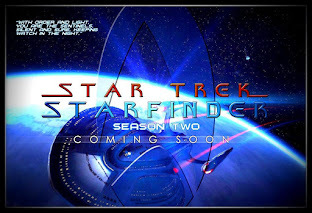 The magazine replays through the updates of the Rhode Island both from the in-universe perspective of Endgame plus then from the point of view of Rob Bonchune who took it upon himself in his own time to tweak the popular Nova Class for the Voyager finale. Of course the former section does tend to meander into retelling the episode but you can forgive that when you read the development information. Perhaps the grumble this month should be levelled at the magazine which chooses to talk about the Unimatrix Zero two-parter which has absolutely nothing to do with the starship at all and can only be tediously linked via the Borg. Very odd choice but I guess by this time in the collection it is getting more and more difficult to find relevant topics to include in the magazine. 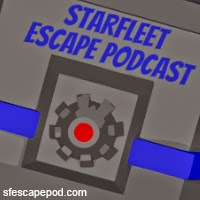 Issue 99 does manage to continue the Borg theme through however with an entry from the Enterprise batch. 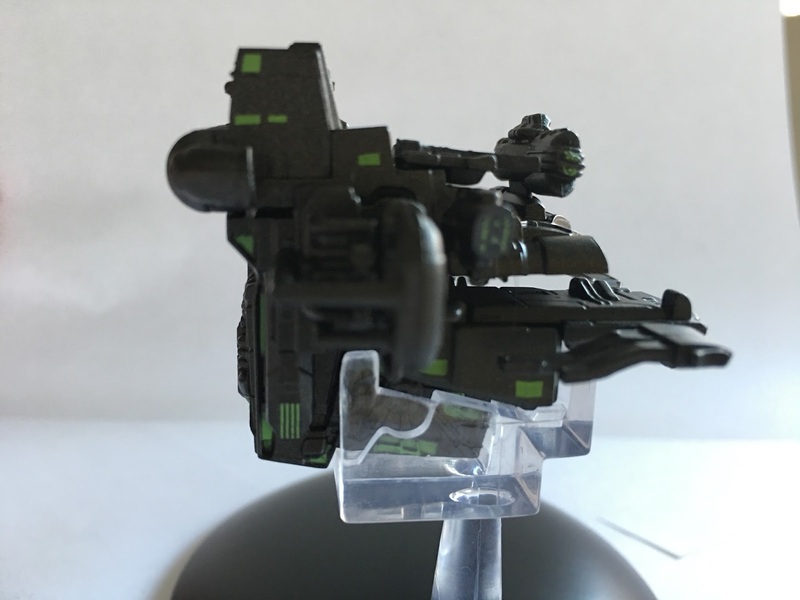 One of those occasional curve ball craft, the Assimilated Arctic Transport is a real crazy inclusion. From the second season episode Regeneration, the transport starts out looking very different but ends up Borgified by the end of the show. It also comes with the weirdest most fiddly, hardest stand in the whole collection to get the damn thing on. Be warned there could be breakages with this one. Ok, there's a lot to talk about here because it has got a lot going on. For starters there are aerials and antennae all over the place. Right at the front there are protrusions from the nose as well as two spiked arrays jutting aggressively out from the sides and ahead of the craft. Now it might be as ugly as sin but you have to take this one as it comes because the craft of the final item is actually really, really good. I don't especially like this one but there's so much to pour over. Cloaked comprehensively in black, the transport surface is a roadmap of bumps and undulations indicating the haphazard manner in which it was being changed as the episode progressed. Everywhere you look there's something going on or a piece of technology that seems to be reaching out over the surface; it's almost Borg artwork. That individuality *which is not something you say everyday about the Borg!) and bespoke surface work covers the whole thing from top to bottom and front to back with almost no space to breath. The further back you do go, the more intense and crazy the modifications get with one whole side of the transport asymmetrical to the other thanks to a huge clunking piece of machinery. A uniform colour once again there are little blips of green against the black which hint at the typical Borg paint scheme that marks out their vessels. But it's not about the paint here because this is a ship that has lots of ins and outs - literally. The whole back end is a maze of pipes, aerials and workings that expand out from the original vessel and actually produce a fairly chilling end result. The single tone paint doesn't detract from the detail as every piece has a clear form but it is a rather fragile piece. Not the level of the Bajoran Solar Sailor I have to say but it's one of the less stable pieces due to the flex in some of the antennae. Flipped over you can see the single metallic piece here is the inset underside of the transport. Covered with Borg tech in every space possible, you can barely see the original hidden underneath. The additional green highlights do break up the monotone but the surface changes still mean everything can be made out. The challenge with the transport though has to have been working out a location for the stand to fit and the result is ingenious if rather tight. It fits around the large rear section just managing to avoid a couple of those pesky aerials. It's a firm grip and getting it off provides an even greater risk to your model. I wish you all good luck. Into the magazine and we talk about the plot of Regeneration and are then taken into the two-fold design process for the ship. While it finishes up in this configuration (and was ultimately supposed to become a Borg Sphere) it began life as a civilian ship used to transport scientists up to the Arctic to investigate some unknown wreckage from a crash many, many years before. The process takes us through the steps that see the ship evolve during the show which is a very interesting read given how little we really know about this one. 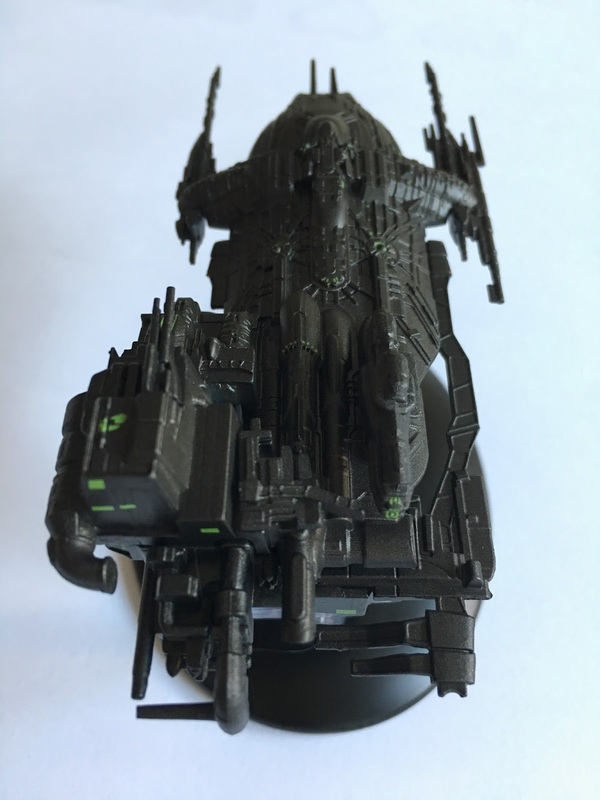 Budget constraints on the product do become very evident when you take a look at the plan views (and the cover) of the Assimilated Arctic Transport. There the textures and shading across the ship really do look amazing. 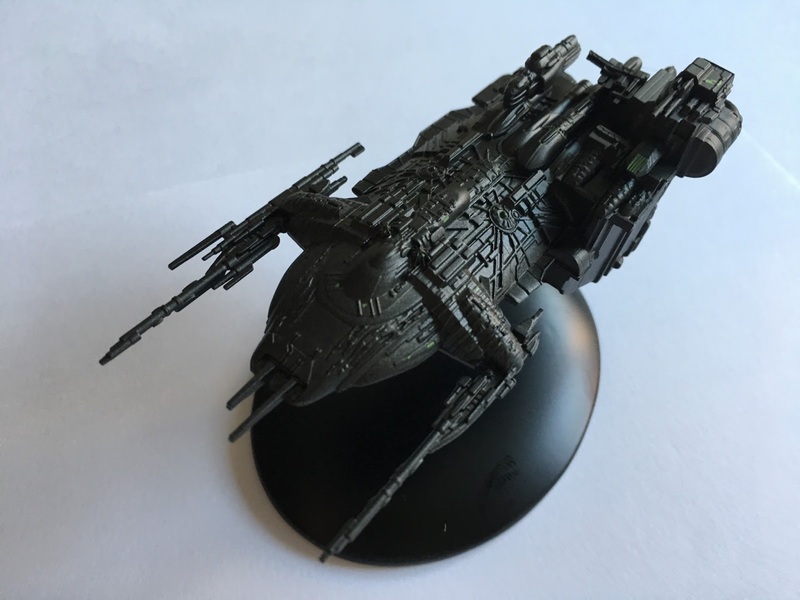 Sadly with plastic and metal and on such a small scale it becomes difficult to truly belay its true nature and I think we can use the Species 8472 Bioship as another example of that. Then we get Mike Sussman's first hand account of how Regeneration came about. It's one of those episodes that splits fans down the middle. I used to hate it because I felt it ruined the Borg but after a recent revisit I realised it's a clever story sequelling the First Contact movie and prequelling Q Who? all in 42 minutes. 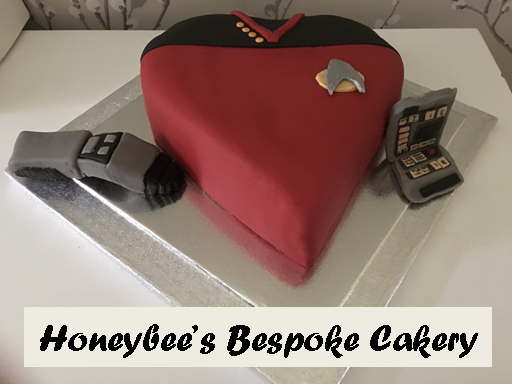 If truth be told because the Enterprise-E didn't clean up their mess properly it's their fault the Borg take a glance over at the Alpha Quadrant 200 years after this story. Reading Sussman's interview and recollections has added a new slant for me on the episode and it's even tempted me to give it another shot. If there's one thing that Regeneration does do, it makes the Borg hauntingly mysterious and terrifying all over again - something that I don't think had been successfully managed since First Contact. Issues 98 and 99 are great entries into the series and even at this stage it's not running out of steam but instead seems to be producing better and better items. Coming next month we have issue - wait for it - 100!!! 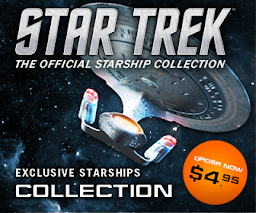 This means we'll be seeing the seminal Daedalus Class along with the Bajoran Freighter for issue 101. Still collecting or have you called it a day?